Few people in history have received as many mixed reviews as Kit Carson. The larger-than-life mountain man, trapper, scout, soldier, and Indian fighter was in his lifetime one of the most famous characters of the American West -- the subject of books and movies. There are mountains, parks, a state capital and a national forest named after him. In Colorado, where he is still a hero, bronze Kit Carson statues grace parks from Denver to Trinidad. But in New Mexico, not so much. An exhibit on Carson in the New Mexico History Museum in Santa Fe states flatly that Carson was “admired by a few, despised by many.” Ouch. A 2014 article in the Albuquerque Tribune was headlined: “Kit Carson: The Most Hated White Guy in American History?” The article seemed to conclude yes – at least in New Mexico, a state that ironically treasures every association it has with the outlaw Billy the Kid. Nowhere in New Mexico is this dichotomy over Kit Carson more intense than in Taos, the pretty mountain valley town where he spent 25 years of his life. Carson’s third wife, Josefa Jaramillo, was from Taos. They married here in 1843 and had seven children. She died giving birth to their eighth. A heartbroken Carson died a month later. They are buried side-by-side in a small park in the heart of Taos, called the Kit Carson Park and Historic Cemetery. And that’s where the problems begin. In 2014, there was a movement in Taos to remove Carson’s name from the park. Interpretive signs by his quiet gravesite were defaced and at city council meetings he was called a “murderer” and blamed for the “Long Walk” of the Navajos, an infamous chapter of American history in which the Navajo tribe was forcibly removed from their homelands in Arizona and marched 400 miles in winter to a reservation, where thousands of them died. It was a Navajo version of the Holocaust. Carson wasn’t on the march, but along with George Armstrong Custer, in the changing times of the 21st century, he has become a symbol of the tragedies inflicted on Native Americans during the “winning” of the West. Which is a fact that would have struck the humble Kit Carson as simply amazing. A short and shy man, he was illiterate and couldn’t even sign his own name. Despite that, he was fluent in both French and Spanish, as well as Apache, Comanche, Cheyenne, Arapaho, Crow, Blackfoot, Ute and Dine (Navajo). He had two Indian wives, lived and traded with the Indians for years and was considered one of the best and fairest of Indian agents. He served as the principal guide to the John C. Fremont expeditions of the Oregon Trail, which was the 19th century equivalent of being an astronaut. Fremont’s widely read journals made Kit Carson a household name across America. During the War with Mexico, Carson helped capture California, sneaking through enemy lines in the dark and running 23 miles to get reinforcements. Later, he commanded Union forces with honor in the Civil War. In his lifetime, Kit Carson covered thousands of miles on foot and horseback across the American West, but you can get an intimate glimpse of both sides of the man in just a short walk around the Taos Plaza. There has been a plaza in the center of Taos for more than 200 years. Originally, it was a fortified square where livestock could be kept safe at night, but today, it’s a quiet park with large shade trees and benches, surrounded by adobe buildings in the Spanish Colonial and Territorial Revival style. Since the buildings are all connected, when one caught fire, they all caught fire, and they’ve been burning down together for two centuries, leading, of course, to many changes. The current buildings date back to the golden era of 1930s tourism, when artists and writers such as D.H. Lawrence lived here. They drip with New Mexico charm with covered verandas, exposed wood beams, adobe walls and shops sparkling with turquoise jewelry, silver, and bright Indian blankets. Just a block from the plaza is where Kit and Josefa lived in a four-room, 1820s adobe house that is now a National Historic Landmark operated as the Kit Carson Home & Museum. You enter the museum through a pleasant courtyard. This is where the Carsons did most of their living. The courtyard was where people cooked, washed, and socialized. It’s also where Carson conducted business as an Indian agent for the Utes, Apaches, and Taos Pueblo tribes. Many tribesmen pitched their teepees in the courtyard, where their children played with Kit Carson’s. The kitchen is reconstructed as it would have been, when food was prepared here for the nine Carsons. Taos was still the frontier and life was very simple with few possessions. Each of the rooms had a fireplace, which was the only heat. Much of the museum is devoted to Josefa Carson, and you learn that Kit wasn’t the only Carson with adventures. Josefa’s sister, Ignacia, was married to the second most famous citizen in Taos, former mountain man and trader Charles Bent, who in 1846 was appointed governor of New Mexico. They lived around the corner, and you can walk to their home, also a museum, in a few minutes. The Governor Bent Museum is a crazy, hodgepodge collection of Old West memorabilia including bearskins, arrows, guns, eight-legged lambs, farm tools, and Indian baskets. It was opened in 1959, which appears to be the last time any exhibit was dusted. Tom Noeding’s parents opened it and today he runs it, so if it’s open, that means he’s there and can point out the room where the famous fireplace was. The murder would have taken place right about at the sign. While Kit was out of town in January 1847, Josefa Carson was staying with her sister at this house when the Taos Revolt began. Taos and all of New Mexico had been ruled first by Native Americans, then Spanish, then Mexican, and then in 1846 by the United States, who captured it in the War with Mexico and appointed the first Anglo governor, Charles Bent. It was too much change too fast for the locals. Tensions built and an angry mob of Taos Pueblo natives and local Hispanic residents revolted and marched on the Governor’s house. Bent tried to calm them down, but they grabbed him from the house, shot him full of arrows, scalped him alive and literally tore his body to pieces, all in front of what is now the quiet Op. Cit Bookstore. Meanwhile, Josefa Carson and her sister Ignacia seized a poker and spoons and managed to dig a hole through the adobe wall at the back of the fireplace, and escape. After the gruesome murder, the Carsons helped care for Ignacia and her children. Ignacia lived to be 68 and she and her grandchildren are buried in the Kit Carson Cemetery Park, not far from her sister and Kit. If there was a tragedy to Kit Carson’s life, it is that he was amazingly good at whatever he set out to do. Unfortunately, this included fighting a war against the Navajos in 1865. Twice, he refused the assignment, but as a soldier he was finally ordered by Brigadier General James Carleton to lead the campaign. Carson reluctantly did, but he deliberately disobeyed his brutal orders to “capture the women and kill all the men.” Instead he waged a mostly nonviolent, “scorched earth” war by destroying the Navajo’s food sources, which forced them to surrender with little loss of life. Sadly, in the end, the results were equally horrifying. The Navajos were ripped from their land by other soldiers and forced on the deadly long march to a reservation, which killed thousands. Naturally, they blamed Carson for their defeat and never forgave him. Ironically, Carson had nothing to do with the Long March, and he even went to Washington to lobby for the Navajos to be returned to their homeland, which they were in 1868. When Kit was near death, he allegedly said: “I wish I had time for just one more bowl of chili.” And by that he meant, Taos chili. Delicious cuisine is just one reason that millions of visitors flow to this beautiful artist community and outdoor recreation center every year. In addition to skiing, Taos is known for river running on the Rio Grande, hiking, fishing, and spectacular mountain scenery. There are dozens of art galleries and a fantastic assortment of restaurants, many specializing in New Mexico cuisine based upon the most famous of all green chiles, those grown in NM. The Eskes Brew Pub & Eatery near the main square has an excellent green chile stew as well as half dozen of their own craft beers. Wednesday night is “Bluegrass Night,” with many local musicians pickin’ away on guitars, banjos and fiddles. Another must visit is the Taos Pueblo, four miles from town. This is the oldest continuously inhabited spot in North America. The two main structures are believed to be well over 1,000 years old and consist of individual adobe homes built side by side and in layers, with common walls and no connecting doorways. They look today much like they would have when Kit Carson was their Indian agent; the only change to the adobe structures was the addition of blue entrance doors (the homes were originally entered via ladders from holes in the ceiling). Between 50 and 100 people still live in the Taos Pueblo without running water or electricity. Students give tours, and several of the buildings are open as shops selling jewelry, pottery and Indian fry bread. The original San Geronimo church is now a cemetery. In 1847, shortly after the uprising in which Charles Bent was killed and Josefa Carson had her narrow escape, the U.S. Army attacked Taos Pueblo in reprisal. Many of the Taos Pueblo people went to the San Geronimo church for protection. The army wheeled a cannon to the church, and fired into it point blank, killing dozens of women and children. The ruins of the church became a cemetery and the leaders of the revolt were hung in Taos Plaza. Visiting today, it’s hard to believe this tranquil and beautiful spot had such a bloody past. Because of past oppressions against them, the language of the Taos People, Tiwa, is unwritten and unrecorded and is passed down orally from generation to generation. It is quite remarkable to see people live here as they did centuries ago and walk literally back into the days of Kit Carson. 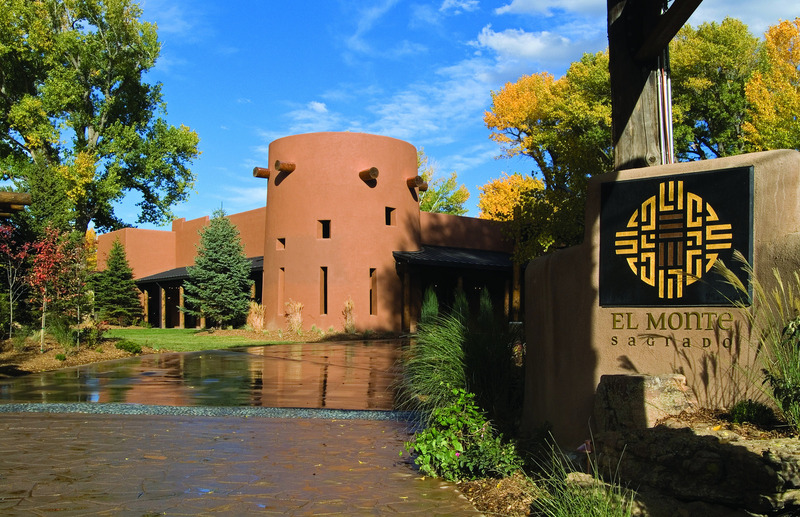 Just a short walk down Kit Carson Road from Kit’s old house is El Monte Sagrado Living Resort & Spa – one of those rarest of rare finds – a world-class luxurious resort and spa within easy walking distance of a historic district. El Monte Sagrado (which means “The Holy Mountain”) is spread over a beautiful 11-acre oasis filled with ponds, streams, wildflowers, bridges, waterfalls and aspen trees. The 84-room resort became a Heritage Hotel & Resort 10 months ago. The largest independent hotel brand in New Mexico, Heritage takes great pride in their collection of culturally distinct properties, and it shows. They are pumping big money into the $70 million, AAA Four Diamond resort, including major improvements to the rooms, landscaping and cultural amenities, as well as adding to the resort’s 300 piece art collection. 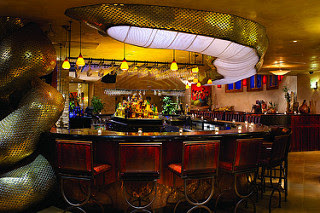 The Anaconda Bar has a gigantic snake curling around it. Among the new amenities are regularly scheduled concerts by Native American flutist Robert Mirabal. A two time Grammy Award winner, Mirabal is also working with the hotel and Taos Pueblo to introduce a new garden at El Monte Sagrado that will use ancient seeds to grow Native American foods and spices on the hotel’s grounds for use in its kitchens. The hotel’s gorgeous restaurant, De La Tierra, serves all three meals, inside or on the patio. For dinner, go local and try the Caprice Cactus salad, the Crab Quesadilla and the Elk Chop seared and glazed with Chipotle agave nectar. The hip Anaconda Bar next door has a gigantic snake sculpture wrapped around the horseshoe-shaped bar and has one of the best happy hours in Taos with $3.50 local drafts and $5 house margaritas. The lovely grounds have streams and waterfalls. The resort offers six types of rooms. At the top end, the Global Suites are 1,100-sq. ft. casitas (small bungalows) each decorated with original art and architecture to reflect different regions of the world, from China, Japan and Spain to Morocco, Mexico and Argentina. Each of the casitas has two bedrooms, two baths, log beam ceilings and all luxury amenities from wet bars to pueblo-style gas fireplaces. Four of them have hot tubs. If it seems strange to have a global theme in Taos, there’s no worries. It works beautifully with the patios walking out into the gardens. The premiere suites carry the global theme to Bali, Egypt and Tibet, while the 18 Native American suites each carry the name of a famous historic Native American and come with king beds, kiva-style fireplaces and balconies or courtyards overlooking the Sacred Circle, the green space surrounded by willow and cottonwood trees that is the center of the resort. One of the spa rooms. Finally, the Casita Suites are fun and funky, part of the original historic hotel with true 1930s New Mexico style and private patios, all upgraded with modern amenities, while the Taos Mountain Rooms are more tradition resort rooms but with private balconies, fireplaces, jet soaking tubs and access to all the amenities of the resort. And then there’s the spa. 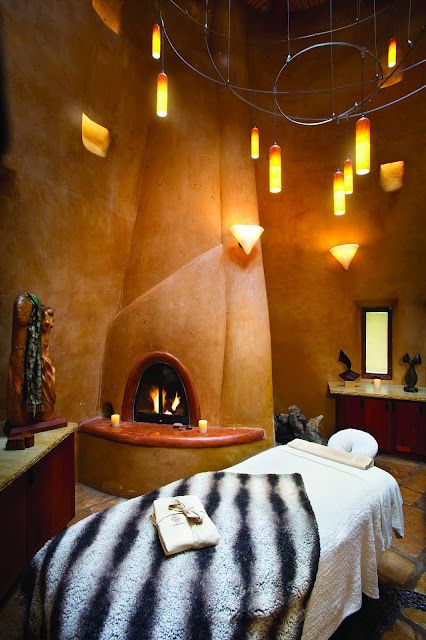 The Living Spa, as it’s called, has won awards from Conde Nast Traveler to Spa Finder, and no wonder. The ten gorgeous and eco-conscious treatment rooms offer benefits such as a sunlit shower and natural waterfall cooling system. Kit Carson probably took a natural shower in a waterfall, but not like this. There are candlelit couple’s suites, Thai massage sessions, 90-minute facials…and when you’re done, don a robe and walk through the gardens to the saltwater pool for a long relaxing soak. Kit Carson would have never left Taos if he had discovered this place. Great post and one of my favorite places in New Mexico. You're photos are always so beautiful and I love the stories that go along with them. Thanks for sharing..